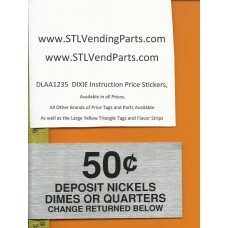 This Sale is for ONE .50 Dixe Narco Soda Vending Machine Price Label Self Stick Sticker with Instructions or Directions for using the machine. Most prices are available, if you do not see the price you want just ask and we can probably get it. To see a list of what specific prices are in stock and to order that price type DLAA1235 in the search box at the top right. If you order a CHOICE OF, Then be sure to Email us with what price you want it to be. If you do not want a price on your directions then you should purchase (DLAA1051) which is the Directions only. 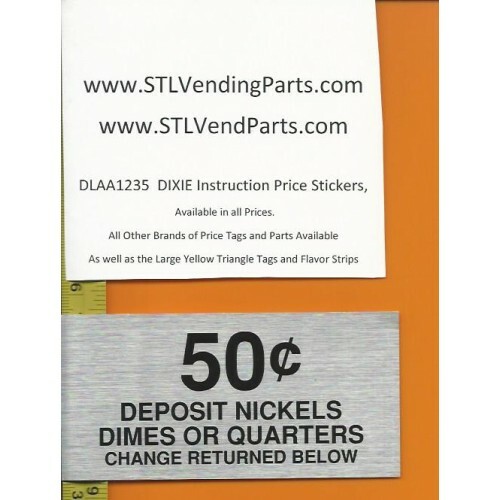 For a full listing of price and Direction tags for other machine choose the Main Menu of LABELS CARDS AND STICKERS at the top of the page. If you don't see it, just email us. We should carry it, just do not yet have it listed.